Hello Girls! It’s our favorite time of the year. Because? Obviously season of festivals are around the corner. 😀 This is the only time when we get time to spend ourselves with our close ones and do lot of fun. And guess what? Festive season gives us plenty of reasons to dress up. So yeah, shop shop shop till we drop drop drop!! 😉 We literally pour our heart into everything. We’ve seen how our beloved celebs flaunt their traditional look with such grace and beauty. So, today we are going to give you some inspiration of your most preferred celebrity style dresses which you definitely should try this season. We are absolutely in love with Alia’s style. She gives us an idea about how to carry this short kurta, paired with plain white skirt adored with those beautiful pair of jhumkas with such ease and elegance. We are, without a doubt, going to steal her style this season! It’s perfect attire if you want to grab attention at your besties wedding and wish to look like a doll. Let’s face it girls! We absolutely worship Deepika’s style. No one can pull of a saree with such classiness other than her. We can surely get an inspiration of her style that how to drape saree so beautifully. And do not forget. Jhumkis are must with smokey eye and minimal makeup. It’s a perfect style inspiration for Diwali and the wedding season. Oh! How stunning Sonakshi looks in this gorgeous golden blouse and a plain peach colored saree with fine details on the border line. We are definitely crushing on her traditional look. If you want to look simple yet sophisticated, drape yourself with a plain saree with a heavy worked golden blouse as it will fetch you the much needed spotlight. If you’re a sucker of the color black, then this Gauhar’s look is a must for you. It is ideal for every festive occasion, be it Navratri, Diwali or a wedding ceremony. But make sure your suit has golden embroidery work since no other color blends well with black. Also try to keep your make-up as minimum as possible. If you like to mix and match your outfits then this look is for you. The crop top has a western touch to it when styled with an indo western styled maxi skirt and makes it look so simple, gorgeous, vivid and quirky. Beyond doubt, this look is ideal when you’re attending your best friend’s engagement or sangeet session. You gotta call for it! Do you belong from that category of girls who don’t like wearing heavy dresses? Then this Sonam’s look is just the right piece for you. To get this look, all you need is a crop top and a skirt, and a plain dupatta in white color with minimal printed designs. To jazz up your look a little more, add a pair of junky silver jhumkis, knot your hair into a tight bun, apply deep black kohl liner on your eye and bam! You’re ready to go! Anushka Sharma gives us really some oh-so-fresh-yet-stunning inspiration for the coming celebratory months. Dressed in an all black cotton saree along with that lovely looking blouse, studded with gold works, she looks simple yet chic. If you’re not so fond of accessorizing yourself with jewelries, definitely give this look a shot! Dark and serene, it will give an edge to your look, perfect for any girl to stand out from the crowd! Accentuate your style with beautiful red motif blouse and tussar silk fabric Mekhla Chador like our bold Bipasa Basu. Compliment this look with a gajra on your curly tresses, a delicate nose accessory, golden jhumka, kohled eyes, red and gold bangles with a huge red bindi and bold lip color of shade red. That’s it! You’re ready to walk the ramp with that graceful smile of yours. 9. Bling it with Pink! Don’t you think the pink colored lehenga has brightened up Yami Gautam’s look? Pink has the power to make you stand out, look intense and shine amidst the crowd. If you want to turn heads at you while walking down the aisle, then my friend, pink is the color. Style the lehenga with drop down stone earring and voila! You’re ready to rock your ramp! 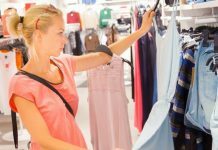 So, you think green is not the suitable color when it comes to fashion? 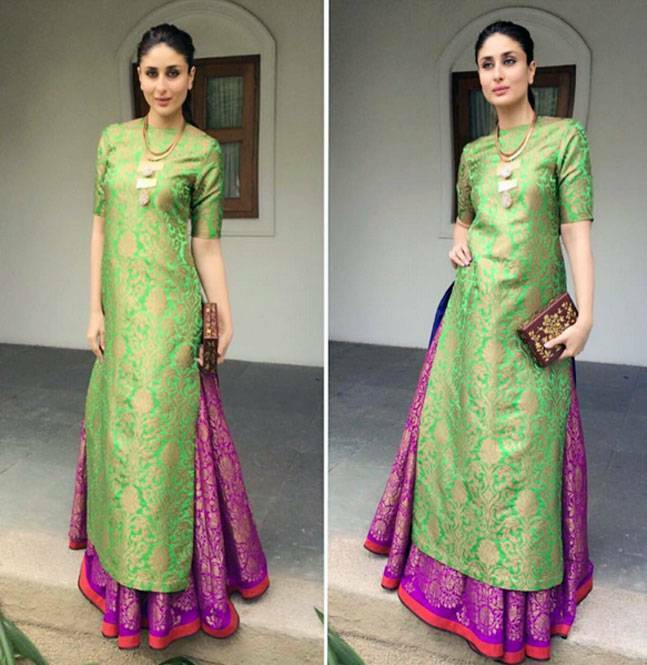 Then my girls, I would suggest you to just look how stunning Kareena looks in this green long kurta worn with a violet skirt with golden shimmery designs paired with nothing but a gold neckpiece. You’re having a second thought, aren’t you? So, get this look on this festive season and stand evergreen amongst the crowd. So, that’s it. These celebrity looks truly stand apart! We hope you will take some inspiration from the mentioned celebrity style dresses and make your own style statement this festive season. And do let us know in the comment box if you want more posts regarding this festive season. We’d be glad to do it for you!
? Sonam is real fashionista..